The production of crop residue varies dramatically across the Inland Pacific Northwest, with estimated residue production for winter wheat ranging from roughly 0.9 ton/acre in the drier grain-fallow cropping system (Figure 1) to 8.5 ton/acre in the wetter annual crop system, which has enough precipitation to support cropping every year. Crop residues are often seen as simply something to “manage” so that they don’t impede future plantings or as a byproduct that can be sold to help improve the bottom line. However, while editing chapters for the recently released publication Advances in Dryland Farming in the Inland Pacific Northwest, I was introduced to another way to think about these residues in the chapter in that publication titled “Crop Residue Management” (.pdf). The lead author, Haiying Tao from Washington State University, and her co-authors make the interesting point that crop residues should be seen as a valuable resource and that there’s an important tradeoff that should be considered before exporting them from the farm. Residues not only serve a critical role in protecting soils from wind and water erosion between crops, they also add carbon and nutrients back to the soil, improving soil health and helping to maintain its productivity over time. In the annual crop areas, once enough residue is kept on the soil surface for meeting soil conservation and soil health needs, there may be options for baling residue and selling it for livestock feed, bedding, mushroom production, feedstock for fiberboard or paper production, or biochar production. While this type of sale may improve the bottom line, it is important to consider the trade-offs involved when making this decision. Partial budgeting (Table 1) allows growers to calculate these tradeoffs. 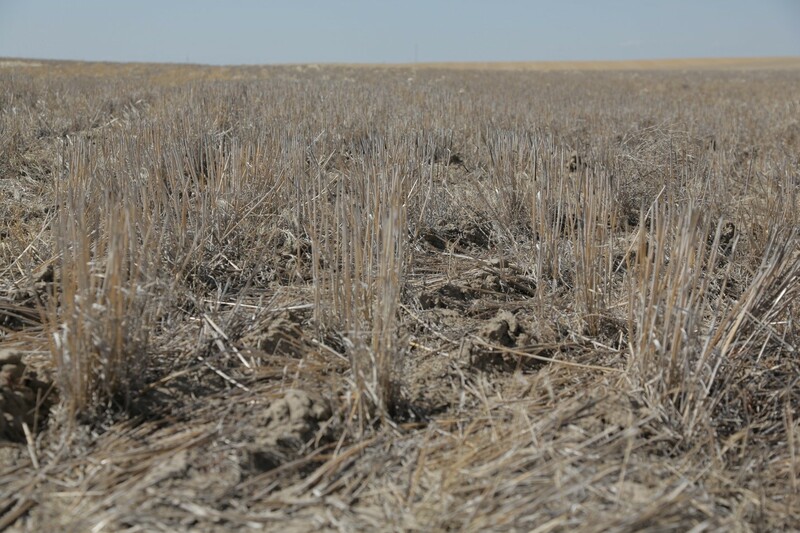 Residue removal involves increased costs including costs for harvest, swathing, baling, and stacking. It also leads to increased revenue from sale of the straw. 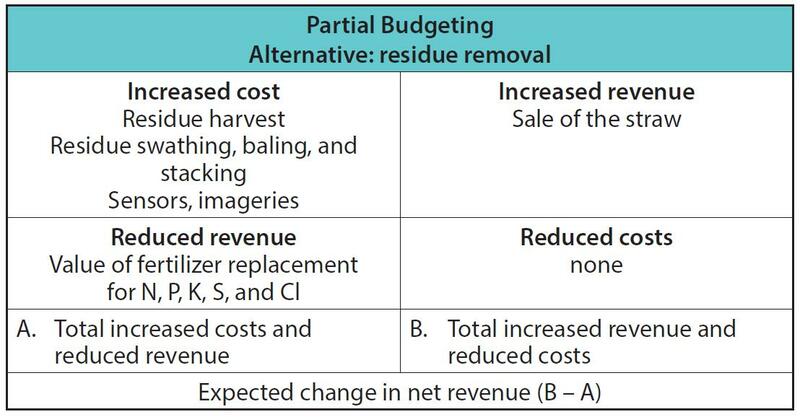 While these are the most obvious items in the partial budget, another, more easily overlooked, consideration is the reduction in revenue due to the need to replace the nutrients removed with the residue (Table 2). Straw contains valuable nutrients such as nitrogen (N), phosphorus (P), potassium (K), and sulfur (S) that, when not returned to the soil for the next crop, must be replaced through the purchase of fertilizer. Depending on fertilizer costs, this cost can be considerable. Say you are a farmer growing winter wheat close to Pullman, Washington and after harvesting wheat from your field, you have 2 tons per acre of wheat straw that you could harvest. If you baled and sold all of your wheat straw, you’d be exporting 17 lb/acre of nitrogen, which would cost you $10.20 in fertilizer to replace. When you include the phosphorus, potassium, and sulfur in the straw, the total value of the nutrients being exported is $24.70. If you also have to pay $61.46 (2 tons x $30.73) to harvest and $14.50 per acre to swath, bale and stack the straw, you would need to get at least $50.33 per ton of straw just to cover costs. And though they are more difficult to quantify, would the gains in organic matter and soil health from leaving the straw on the field tip the balance even further? 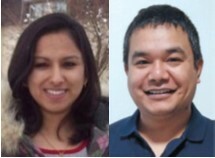 More information on recent research on tillage and residue management systems in the Inland Pacific Northwest is available in in the chapter on Crop Residue Management in Advances in Dryland Farming in the Inland Pacific Northwest or in an archived webinar titled Tillage and Residue Management Systems and Impacts on Soil Health in Drylands co-presented by Dr. Rakesh Awale and Dr. Prakriti Bista , postdoctoral researchers at Oregon State University. Or, for information on topics related to dryland farming in our region, view the whole Advances webinar series. Huggins, D.R., C.E. Kruger, K.M. Painter, and D.P. Uberuaga. 2014. Site-Specific Trade-Offs of Harvesting Cereal Residues as Biofuel Feedstocks in Dryland Annual Cropping Systems of the Pacific Northwest, USA. BioEnergy Research 7(2): 598–608. Tao, H., G. Yorgey, D. Huggins, and D. Wysocki. 2017. Crop Residue Management. In G. Yorgey and C. Kruger (Eds.) 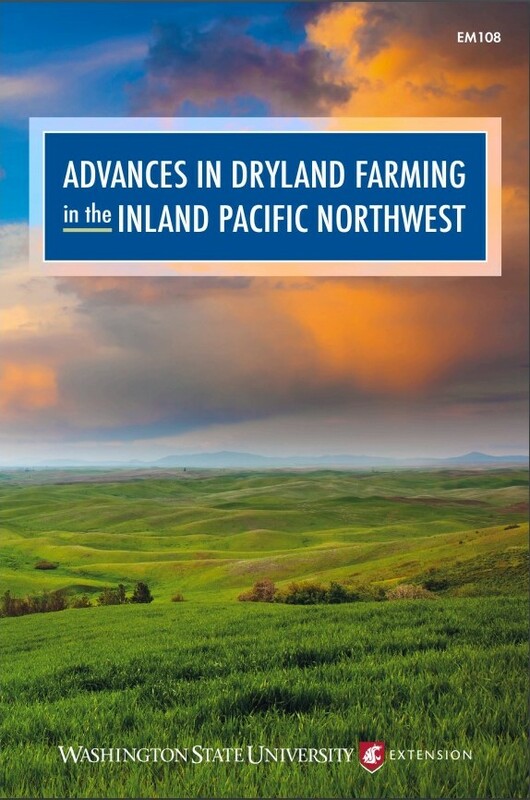 Advances in Dryland Farming in the Inland Pacific Northwest (p. 125-162). Pullman WA: Washington State University Extension. 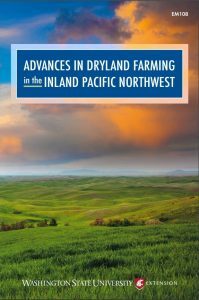 A full set of references for the information presented is available in Crop Residue Management in Advances in Dryland Farming in the Inland Pacific Northwest.